A mansion at 6th & Market Streets in Philadelphia, Pennsylvania served as the executive mansion for the first two Presidents of the United States, while the permanent national capital was under construction in the District of Columbia. 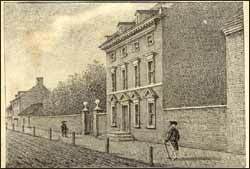 Following a 16-month stay in New York City, George Washington occupied the President's House in Philadelphia from November 1790 to March 1797. John Adams occupied it from March 1797 to June 1800, then became the first President to occupy The White House. For nearly a decade, the Philadelphia mansion served as the seat of the executive branch of the federal government, housed the public and private offices of the President, and was the site of the official entertaining of the nation. Washington's presidential household included nine enslaved Africans from Mount Vernon. John Adams was never a slaveholder. The intertwined history of freedom and slavery is part of the story of the President's House, and of the United States. The Philadelphia mansion was built in the late 1760s by Mary Lawrence Masters, the widow of William Masters, and one of the richest people in the colony. According to tax records, the house was under construction in December 1767, although she and her two daughters are not recorded as definitely living there until 1769. The new house was probably the largest in Philadelphia, and larger than most of the suburban villas surrounding the city. In 1772, her older daughter, Polly, married Richard Penn, the governor of the colony, and a grandson of Pennsylvania's founder, William Penn. Mrs. Masters gave the bride the house as a wedding present. The Penns lived in the house for only about three years. Relations between Great Britain and her American colonies were strained, and some sort of conflict seemed inevitable. The First Continental Congress met at Carpenters' Hall, and Richard Penn entertained many of the delegates at the house, including George Washington. Penn was asked to present the grievances of the colonists to King George III, and he traveled to London in 1775 to deliver the "Olive Branch Petition." The Penns and Mrs. Masters spent the Revolutionary War in England. In September 1777, Philadelphia was under siege. General Sir William Howe, commander-in-chief of British forces in America, sailed up the Chesapeake Bay, and marched his troops toward the city. Washington's soldiers tried to head them off at Brandywine Creek, but were repulsed. The British Army took possession of Philadelphia, and Washington's surprise attack at Germantown, north of the city, was unsuccessful. General Howe made the comfortable Masters-Penn House his residence and headquarters for the winter, while Washington and his troops suffered thirty miles away, at Valley Forge. Waging a long-distance war was expensive for Great Britain, especially one fought with mercenaries. General Howe was recalled to London, and his successor was ordered to abandon Philadelphia and consolidate forces in New York City. The British evacuated on June 18, 1778. Continental soldiers swept into Philadelphia under the command of the newly-named military governor, Major-General Benedict Arnold. He made the Masters-Penn House his residence and headquarters within about a week of his arrival. The general lived like a rich man in Philadelphia, which was curious since he had only a modest army salary, greatly diminished in value by rampant inflation. It is difficult to separate what Arnold actually did from the many things he was later accused of doing, but it seems certain that his lavish lifestyle was supported by graft and profiteering, and possibly outright theft. While living in the house, he met and married Peggy Shippen, and bought one of the grandest suburban villas, Mount Pleasant, although the Arnolds never lived there. His reckless spending raised questions about the source of his wealth and his boorish behavior alienated his supporters, and in March 1779, he was forced to resign his post. Two months later, while still living in the house, Arnold began a treasonous correspondence with the Britsh. RG-17 Land Office Map Collection, Pennsylvania State Archives "Richd Penn's Burnt House Lot — Philadelphia." This groundplan seems to show the property as it was in 1781 when Robert Morris contracted to buy it. Unknown draftsman, ca. 1785. French Consul John Holker rented the house in late 1779, and on January 2, 1780, it suffered a major fire. Robert Morris contracted to buy the fire-damaged building the following year, although he did not obtain title to the property until 1785. It seems likely that Morris had the house rebuilt in 1781, since he is taxed at this location in August of that year, and he is reportedly living there in spring 1782. Morris rebuilt the main house to essentially the same plan as before. His major changes were to the backbuildings: an icehouse was added at the southwest corner of the property (the icehouse's pit was discovered by archaeologists in November 2000), a second story was added to the kitchen ell, and a two-story bath house was built off the east wall of the piazza (its third floor was added in 1784). The expanded house had at least six bedrooms and four servant rooms, space for the Morrises' six children (another child came later) and nine servants. Copyright ©2001-2014 Edward Lawler, Jr. Conjectural Elevation, The President's House in Philadelphia. The second floor of the addition (on the left) contained Washington's private study and probably was where he met with his Cabinet. The ice house is the small building seen on the right. Washington was intimately acquainted with the house. Following the Revolution, he visited Philadelphia regularly and stayed with the Morrises, and he lodged there from May to September 1787 during the Constitutional Convention. In 1790, Philadelphia was named the national capital for a ten-year period while the Federal City (now Washington, D. C.) was under construction. 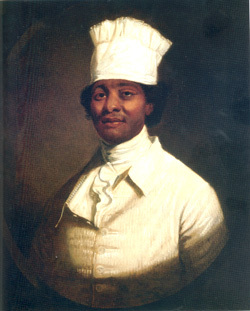 Morris volunteered the house to serve as President Washington's residence. Many Philadelphians were convinced that once the Federal Government moved from New York to their city, it would never leave. Why build a new capital on the banks of the Potomac when the largest and most cosmopolitan city in America was here? An enormous mansion for the President (about two-thirds the size of the White House) was begun on Ninth Street in Philadelphia, although Washington showed his preference for a Potomac capital by arranging to be away on the day of the groundbreaking. The President quietly worked behind the scenes to bring the permanent capital of the United States to Virginia. He insisted on paying rent for Morris's house, and the initial lease was for a 2-year period. Except for trips and stays in Germantown to avoid yellow fever, Washington occupied the Market Street House from November 1790 to March 1797. Morris's Market Street residence was not large enough for Washington's needs. The President visited Morris in September 1790, on his way to Mount Vernon, and planned additions to the house: a large two-story bow to be added to south side of the main house making the rooms at the rear thirty-four feet in length, a long one-story servants' hall to be built on the east side of the kitchen ell, the bathtubs to be removed from the bath house's second floor and the bathingroom turned into the President's private office, additional servant rooms to be constructed, and an expansion of the stables. In November, when the presidential household moved in, there were up to thirty people living on the premises: Washington, his wife, Martha, and her grandchildren, Nelly and G. W. Parke Custis; Chief Secretary Tobias Lear, his wife, and the three male secretaries; eight enslaved Africans from Mount Vernon; and about fifteen white servants. Pennsylvania's government was the first in the Western Hemisphere to take steps to abolish slavery. In 1780, it enacted the Gradual Abolition Law — prohibiting further importation of slaves into the state. But the law also respected the property rights of Pennsylvania slaveholders by freeing only the future children of enslaved mothers. Children born or living in the state before March 1, 1780, remained enslaved for life (or until 1847, when legal slavery finally ended in Pennsylvania). The 1780 law was lax regarding non-resident slave-holders living in Pennsylvania on a temporary basis. It provided a mechanism for these enslaved to legally obtain their freedom, provided they established a 6-month residency in Pennsylvania. To prevent this, non-resident slaveholders simply interrupted the residency by taking their slaves out of the state before the 6-month deadline. A 1788 amendment prohibited this rotation of slaves in and out of Pennsylvania. But Washington knowingly and repeatedly violated this amendment to the Gradual Abolition Law. He maintained that his presence in Philadelphia was a consequence of its being the national capital, that he remained a citizen of Virginia, and he was careful that he himself never spent six continuous months in Pennsylvania, which might be interpreted as establishing legal residency. Nine enslaved Africans worked in the President's House: Oney Judge, Austin, Moll, Giles, Paris, Christopher Sheels, Hercules, Richmond, and Joe (Richardson). Click here to read biographical sketches. Gradually, the enslaved Africans in the presidential household were replaced by white German indentured servants. 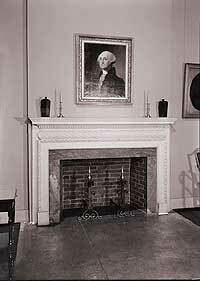 HSP Collection, Atwater Kent Museum Mantelpiece from the President's House. Photo by Jack E. Boucher, ca. 1965. Historic American Buildings Survey, no. PA-1942. The President's House was where the business of the Executive Branch of the Federal Government was conducted. The public office, the equivalent of the West Wing, was a single room on the third floor. The house was also where the official entertaining of the new nation took place. Washington held public audiences or "levees" on Tuesday afternoons, and regular State dinners on Thursdays. Mrs. Washington had receptions or "drawingrooms" on Friday evenings, and there were open houses on New Year's Day and the Fourth of July. In addition to this heavy schedule of regular entertaining, there were smaller dinners during the week, and Washington often conducted business over breakfast. Two important areas within the house were the bow window added to the first floor rear room, where the President stood (Washington, and later Adams) on ceremonial occasions — levees, an ambassador presenting his credentials, speeches, etc. (the partial foundations of this bow window were uncovered by archaeologists in May 2007); and the second floor private office (the former bathingroom) which was the equivalent of the Oval Office, and served as the Cabinet Room. The yellow fever epidemic that ravaged Philadelphia in 1793 and killed more than 10 percent of the population pretty much dashed the hopes for the city remaining the national (or even the state) capital. It was suspected that there was something about Philadelphia's water or climate that was unhealthy, and the disease reappeared several times in the 1790s. 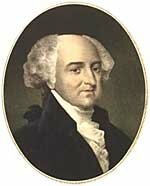 John Adams spent most of his one term as President in Philadelphia. He moved to the White House on Saturday, November 1, 1800. The following Tuesday he lost the Presidential election to Thomas Jefferson. Adams succeeded Washington as President, and, after declining to occupy the newly completed mansion on Ninth Street, he moved into the Market Street house in March 1797. Washington died on December 14, 1799, and a huge ceremonial funeral procession and church service were held in Philadelphia on the day after Christmas. This was when "Light Horse Harry" Lee eulogized Washington as "First in War, first in Peace, and first in the hearts of his Countrymen." The following evening a couple of hundred mourners attended Mrs. Adams's "drawingroom" at the President's House. The Residence Act of 1790 called for the District of Columbia to become the national capital on the first Monday in December, 1800. Adams left Philadelphia in late May, and spent several months on his farm in Massachusetts before moving into the White House on November 1. The Philadelphia house was converted into Francis's Union Hotel, and Mrs. Adams stayed there on her way south from Massachusetts to the new capital. This photograph shows the south side of the 500 block of Market Street in 1949. The President's House's surviving eastern wall is at center. The "ghost" of the mansion is outlined in red. From the Evening Bulletin Newspaper Collection, Urban Archives, Temple University. The hotel was not a success, and the former President's House was stripped of much of its architectural ornament and converted into stores and a boardinghouse. In 1832, the building was gutted, leaving only its side walls and foundations, and three narrow stores were built within the same Market Street frontage. The house's original side walls were exposed when the stores themselves were demolished in 1935, but no one recognized them for what they were. Most of the western wall was removed by 1941, and what remained of it along with the eastern wall were demolished in 1951 to create Independence Mall. The site of the President's House lies directly across Market Street from the entrance to the Independence Visitor Center. A public bathroom was built on the site in 1954, and stood squarely atop the footprint of the main house until its removal on May 27, 2003. 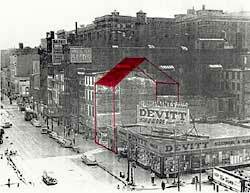 In 2002-03 the Liberty Bell Center was built, partially covering the footprint of the house's backbuildings. Under the LBC's porch, 5 feet from the main entrance, is the site of the quarters for the stable workers, two or three of whom were enslaved. When this was revealed in the press in March 2002, it caused a public uproar. The Pennsylania State Legislature and the Philadelphia City Council called on the National Park Service to commemorate the house and its residents, especially the enslaved African Americans. In July 2002, the U.S. House of Representatives approved an amendment to the 2003 Department of Interior budget requiring the NPS to do the same. In January 2003, preliminary designs were unveiled for a $4.5 million commemoration of the house and its residents. Although it commemorated the enslaved Africans and went a long way in interpreting Black History, the design's marking of the house's footprint did not include the slave quarters, and was rejected by Philadelphia's African American community. At the Liberty Bell Center's opening in October 2003, Philadelphia's Mayor John F. Street pledged $1.5 million toward making the President's House commemoration happen. In 2005, Congressmen Chaka Fattah and Robert Brady secured $3.6 million in federal funds for the project, and a design competition was begun. Kelly-Maiello Inc. of Philadelphia won the competition in February 2007. The following month, an archaeological dig was begun on a section of the property. Foundations of the main house, the kitchen ell, an underground passage connecting the two, and Washington's bow window were uncovered. Kelly-Maiello unveiled revised designs, incorporating the archaeology, in December 2007, and the city increased its contribution to $3.5 million. A new $10.5 million budget was announced — $8.5 million for construction, $2 million as an endowment — and Mayor Michael Nutter's administration held a September 2008 fund-raiser. In February 2009, Delaware River Port Authority approved a $3.5 million contribution. Construction of the commemoration began in August 2009. Interpretation for the commemoration was begun by the American History Workshop. AHW's research uncovered a "Runaway Ad" documenting Oney Judge's May 21, 1796 escape to freedom. Eisterhold Associates Inc. took over interpretation in December 2009. Copyright ©1999- by the Independence Hall Association, a nonprofit organization in Philadelphia, Pennsylvania, founded in 1942. Publishing electronically as ushistory.org. On the Internet since July 4, 1995.